Born in Osaka, Japan and raised in Amagasaki City, Hyogo. 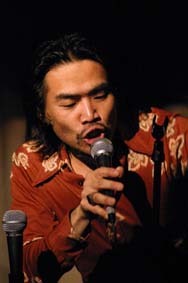 He started his carrer by singing Jazz in Tokyo. Since he moved to New York City in 1989, he's performed at a lot of clubs and festivals, such as "La Place on Park", "Yard Bird Suite", "Elbow Room", "Asian American Heritage Festival". He composes songs with influences of various kinds of music like Jazz, Japanese, Blues, R&B, Brazilian, African etc. and sings Jazz and his original music as well with his band. He also plays African percussions (Ashiko, Shekere etc), performing with dancers and bands. He came back to Japan in 2002 to start his new carrer in Japan. He's pursuing to deliver good messages & vibrations by using the sound of his voice itself more than what the lyrics say. Now he performs with his band and also duo unit (singing and playing African drum with a guitarist). 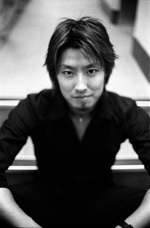 * In 2005, he won the Grand Prize in the vocal category at the 24th Asakusa Jazz Contest. * In 2012, CD「Toshihiro Kajiyama & 肚（HARA)／Sky and Sea」 was released.